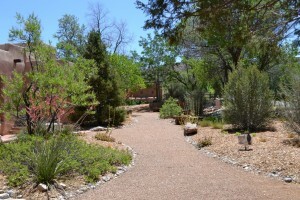 The Placitas Memorial Garden provides a quiet shady garden that is a perfect place for relaxation and meditation. 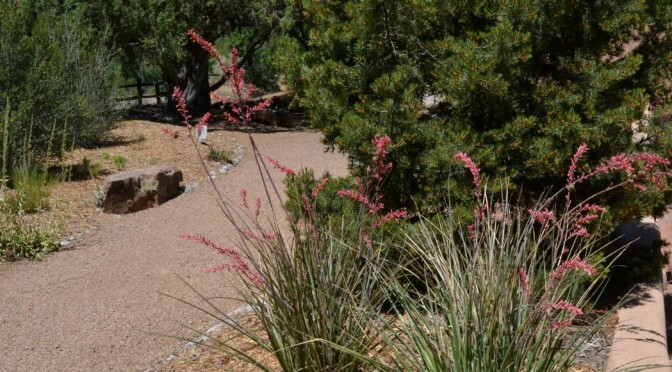 It serves as a demonstration garden for native plant horticulture and acequia-based drip irrigation and a location for community members to memorialize loved ones, as well. The garden features stone benches, a ramada, a stone pulpit, an inscripted granite slab and a water feature that attracts bees and birds. The garden is located on route 165 in Placitas on the east side of the Las Placitas Presbyterian Church grounds. It is available for visitation morning through evening daily. Six SCMG volunteers are needed occasionally to do seasonal maintenance of the garden, i.e. weeding, mulching, trimming, and planting new plants. Volunteers serve a few times a year. The project coordinator will notify Master Gardeners as they are needed.